Last week I paid a visit to New York City where I was able to excavate deeper into its famed bodega culture–a loose network of cramped, corner markets specializing in malt liquor and, if you’re lucky, deli counters serving samosas and daal in Chelsea, or soulful Caribbean food in Crown Heights. I loved the idea of finding something delicious and substantial in places stocked with Pringles cans and lotto tickets. Little did I know that nostalgia-tinged Burbank would cure my big city bodega blues. Tucked inside a non-descript liquor store called Favorite on the corner of Victory and Providence is World Empanadas, a two-year-old family-run deli counter that serves sandwiches (chorizo and chicken milanese), breakfast burritos, and twelve different types of empanadas ($2.50 each). Burbank native Matthew Hirtz mans the kitchen and develops the recipes. Hirtz worked at Granville for two years after completing his culinary degree at Le Cordon Bleu. “My mom is from Mexico, my dad from Argentina. It made sense to combine the traditions and add a modern twist,” says Hirtz, who gave up his first idea, involving pasta making, to pursue making empanadas. Hirtz bakes his dough instead of frying it. They’re wonderfully airy and flaky as a result–reminiscent of a fine pastry–with just the right amount of interior density and moisture. 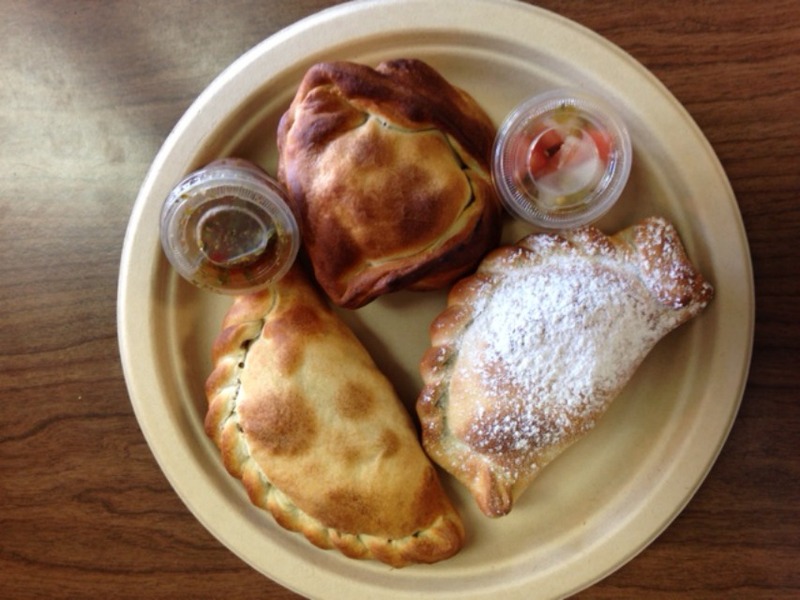 The Santa Fe chicken came seasoned with cayenne; the beef empanada was given extra heft from potatoes and green olives. A side of chimichurri sauce adds a fresh herbaceous quality, tangy and mildly sweet. You’ll also find options like creamy corn, spicy potato, chile con carne, spinach, quinoa and lentils, as well as a dessert version with diced apples and dulce de leche topped with powdered sugar. This week’s Friday special is crab. In the past they’ve featured beef tongue, mole poblano, and even gelato. World Empanadas is opening up a second location soon, so be sure to check the website for updates.